4,806 churches by the end of 2007, an increase of 576 churches over the past year alone. Growth took place across almost all of the denominations with many of the early forerunners again stepping to the fore. Over the last thirty years the gay Christian revival has grown and evolved into the dynamic influence it is today. Thankfully for the last twenty plus years I’ve been blessed to enjoy a “cat bird seat” as my Grandmother would say of the movement’s ebb and flow. Starting first with my involvement with MCC during the mid eighties and then later as the founding pastor of a non-denominational church whose primary ministry was to the gay community. As the nineties drew to a close I followed the Lord’s urging to write “Calling the Rainbow Nation Home” and start www.gaychurch.org. The web site had many important missions to be carried out but none more important than helping folks link up with a local welcoming, Christian church near where they lived. The directory started off with compiling all of the contacts I had built up over the years as pastor and then with the help of a friend, adding in every known welcoming Christian church we could find on the internet. After a year of hard work the first directory was done. As churches were added every year I soon realized that the very act of compiling the directory gave us a wonderful view into the ebb and flow of the movement. We could see how fast the Christian gay movement was growing and where that growth was taking place. Two years later the first “Welcoming Church Survey” newsletter was created. Through the years, I’ve come to believe that the movement has gone through two distinct phases1. They shared a common theme, that of reconciliation, but each had it’s own distinct mission, messenger and audience. In addition, each era was marked by groups or individuals who acted as the forerunners of a particular idea or vision. These groups were later followed by others who expanded upon the vision and helped reap much of the harvest that came from that particular move of God. The other thing that stands out is that there appears to be some overlap between the various movements and phases. Many times, groups that were instrumental in one move help lead the way into the next. The first era clearly began with the emergence of MCC in the early 70’s 2 followed a short while later by Evangelicals Concerned and Dignity. The gay Christian movement was later expanded upon by other ministries such as the Alliance of Christian Churches and the Evangelical Network which appeared in the 1980’s. The primary message during this time was that God loved you just the way you are and that salvation came through ones acceptance of Jesus Christ, not through ones heterosexuality. During this time the gay Christian movement was still pretty much contained within the gay community. Churches sprung out of home bible studies and local ministries. The ministerial ranks were filled with those who had been defrocked by ‘mainstream’ denominations because they were gay. Interestingly enough most of these early ministers came from charismatic or Pentecostal backgrounds, the same denominations that were at the forefront of the anti-gay movement that was occurring at the same time. This first wave of God’s love was a heady time of great church growth and expansion, miracles and evangelistic effort. By the time it began to wind to a close in the mid 1990’s close to 1,000 churches had been birthed. Many of these churches and organizations remain an integral and ongoing part of the Christian movement within the gay community today. The second era of the “Rainbow Revival” begin in the late 80’s and early 1990’s and was marked by the growing national impact 3 of groups like the Lutherans Concerned. More Light Presbyterians, UCC Coalition for LGBT Concerns, Welcoming and Affirming Baptist and Reconciling Ministries Network (UMC). The vision of these groups was to enlighten their particular denominations stance toward the gay and lesbian community (see “denominations”). In addition, geographically based groups such as Chicago Coalition of Welcoming Churches, Community of Welcoming Congregations (OR and WA) and the New Jersey Lesbian and Gay Coalition emerged whose vision crossed denominational lines and was toward a particular geographical community and not toward one particular denomination (see “geographic groups”). The work of these groups helped open hundreds and then thousands of church doors to the gay community throughout the nineties and into the 21st century. Far from abating, this movement has broadened beyond the original five denominations (Lutheran, Presbyterian, UCC, UMC and some Baptist churches) and now includes over sixty different denominations from across the world. 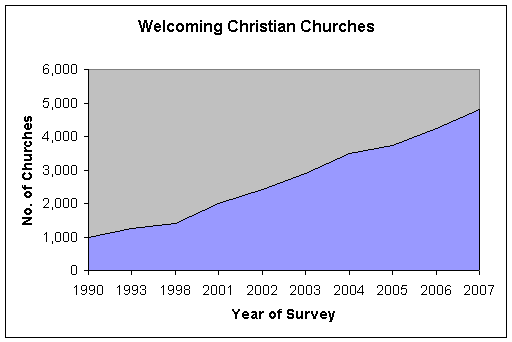 In 2007 576 more churches had been added to the list bringing the total to 4, 806 welcoming Christian churches. The other key trademark of this current phase of the movement is its width and breadth. Currently the directory contains sixty eight different denominations from churches throughout the world. 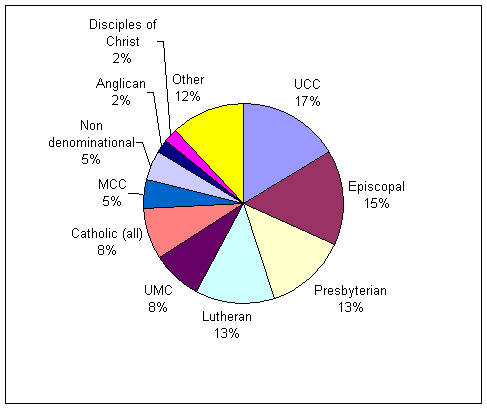 The United Church of Christ still leads the way with over 813 churches followed by the Episcopalian churches, Presbyterian and Lutheran churches. I also got the feeling that a large number of churches requesting to be part of the church directory were not officially affiliated with any gay affirming group within their denomination. If true, this tells me that the movement has become so widespread within many of these denominations that churches no longer feel the need to band together to promote their cause or for protection. Two other interesting facts were that the mainline denominations seem to take turns leapfrogging one another in double digit growth. This year it was the Lutheran’s turn to explode forward with a 57% increase in the number of affirming church assemblies. Some of this can be explained by the amount of time put we can put in researching and corresponding with a particular denominational group. In addition, some denominational groups have more of a web presence than others making it easier (or harder) to find churches to contact. In spite of these factors, every year seems to offer a new group that jumps to the fore in terms of growth. In previous years we had seen such explosive growth out of the UCC, Episcopal and Catholic churches each in due turn. This was also the first time in several years that UCC churches haven’t seen double digit growth indicating that their churches are now beginning to stabilize. The final interesting fact was the number of denominations from around the world that have begun to open their doors. These denominations make up a large proportion of the “Other” category which now accounts for over 12% of the directory with 587 churches. We can see from our listings, that the movement is rapidly expanding beyond the mainline denominations and outside of the borders of the United States. In spite of this rapid growth, mainline denominations still make up the vast majority of churches who have opened their doors to the gay and lesbian community. It is interesting to note that the early forerunners of this gay Christian movement who dominated the church directory listings 10 years ago have slipped to 8th (MCC), 9th (Non-denominational), 13th (Dignity) and 14th (The Alliance) respectively. While their numbers have remained relatively steady, this again demonstrates how this second wave of the movement has been primarily carried forth primarily by the mainline denominations. Note: Only denominations that self-identify as being “Christian” are contained in the church directory. Last year, I was correct in predicting the stabilization of the UCC growth and the crack down within the Catholic parishes (affirming Catholic parishes decreased by almost 12% this last year). I was incorrect in guessing that the United Church of Canada would be one of those who stormed forward with double digit growth. Instead it was the Lutheran congregations that enjoyed an almost 57% growth rate of affirming congregations. These numbers can be a little misleading though, for example, finding welcoming churches in a ‘new’ denomination such as the United Church of Canada can be a very time consuming task involving hundreds of hours of research and potentially thousands of emails. This year I had to return to the work force and couldn’t devote the 40+ hours it took every week to find these new churches. Now I am more reliant on churches contacting me for listing and for other wonderful helpers such as Eric who scour the world wide web for new churches to contact and send an invitation to be added to the directory. Thank you Eric for helping to open so many doors for our gay and lesbian brothers and sisters in Christ. Another interesting development has been the ongoing ‘softening’ of the political rhetoric against the homosexual community. This is one of the first presidential races we’ve had where homosexuality was not one of the political ‘hot topics’. Such a climate makes it easier for churches that may have been sympathetic to their gay brothers and sisters to officially and finally fling open their church doors to our community. The gay Christian movement has undergone massive growth over the past few years with no slowing in sight. The softening political climate here in the States has helped encourage this double digit growth while at the same time this movement has ‘jumped the tracks’ and is no longer a phenomena found in only a few denominations located within the United States. This clearly now is a world-wide movement that touches more than 68 denominations. I also can’t help but feel that we are still in the midst of reaping the harvest from the 2nd wave of this movement and that the third era of the movement hasn’t yet begun. It’s quite possible that the forerunners of this 3rd wave of ministry have already stepped forward with the unique vision, mission and message the Lord has given them.